The third Friday of August is a holiday in Hawai’i. 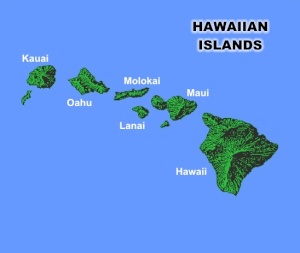 Known as Admission Day or Statehood Day, it commemorates the admission of the Territory of Hawai’i into the United States of America on Friday, August 21, 1959. A summary of the steps towards statehood is given in the “whereas” paragraphs of this 2003 Hawai’i Senate resolution about how the event should be celebrated. An alternative view on whether Hawai’i should actually be a state at all is given in this 1998 short video called An Uncomfortable Truth. California doesn’t celebrate a Statehood Day, so this is the first such holiday I have experienced in the US. Here is an account of how I passed the holiday in my new hometown of Kaunakakai. After a breakfast of papaya slices with black pepper and lime juice – a delicious hack my Kanaka Hawai’i neighbour taught me – and swim at the local pool, I set off on foot for town. The sign on the fence a few houses down encapsulates what is common knowledge about this island: it steadfastly eschews any attempts to turn it into a tourist destination or a home for snowbirds from colder climes on the mainland to winter over in. As this report in the local weekly rag shows, even a modest proposal for an eight-room hotel in town elicited furious opposition. 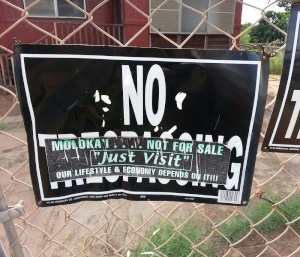 But gained approval anyway, largely because the county legislation under which the Moloka’i Planning Commission was established constrains it to approve anything that has legally met with the county planners’ approval. Across the first intersection on my walk, I come to the area where Maui County services, including the police station, are provided. Maui Parks and Recreation manages the pool where I had my morning swim, the gym where I have my Beginning Ukulele classes on Thursdays, and the large community center where – today – the families with responsibility for doing setup are preparing for a wedding reception later in the evening. These facilities are well used and well maintained, the pool has free admission and the Parks and Rec programs, such as the class I attend, are free but offered only to school-age children and to Seniors. The huge investment of time and resources into children’s wellbeing and personal growth, at both a family and institutional level, is one of the things that has struck me most about this community. The next intersection brings me to the ballpark and the area by the dugouts where picnic tables placed under the huge old trees are a popular meeting spot any time of day because they are optimally placed to catch not just the shade, but also the prevailing breezes from the east. The bleachers next to the field are a popular spot for older folks just wanting to pass the time of day – often with a bottle of their favorite tipple in a brown bag. There’s a power outlet there, and someone always brings his boom box so they can listen to music, as well. Parks and Rec staff and the police pay no mind to them even though they’re technically breaking the law, largely because there’s never any trouble. I wave hello to those I know… and in a small town like this, you get to know people pretty quickly! My first stop is the mailbox lobby at the Post Office. The only area of the island in which mail is delivered to houses is the East End because it has no PO, so the mailbox areas of the three post offices are also a place where people meet and greet and catch up on the latest news. The United States Postal Service being a federal agency, it doesn’t close for state holidays, but in any case the lobby is open 24/7. The bus for the East End drops off and picks up outside the PO, but it’s not running today because of the holiday. Bus services are provided by a county-supported initiative called Maui Economic Opportunity, and they offer free service to the East, West, and Central areas of the island from downtown Kaunakakai, which is on the South Central coast. MEO also provides a Red Card to seniors, which gives discounts or removes the state sales tax on items (including food) purchased at participating stores. I’m now at the start of the main shopping area of town. The derelict Midnite Inn sits across the street from the PO and next to that is one of two supermarkets, which today has a US flag flying outside it. The sign at the entrance of Friendly Market pretty much sums up the key quality you have to have to successfully interact with people here. 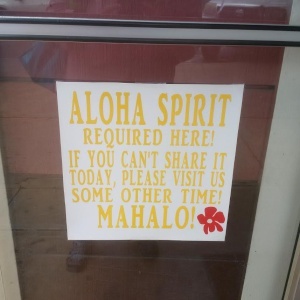 “Aloha” isn’t a tourist slogan. One of the best definitions I have read of that word is in the glossary to Kanaka Hawai’i Cartography, by Renee Pualani Louis: it means compassion, sympathy, kindness, grace. The embodiment of those qualities in your demeanour, backed by your active embrace of them as desirable qualities to aspire to, is the pre-eminent social currency here. My walk through town takes me past the empty lot where a bowling alley once existed during the island’s heyday of pineapple plantations, the other supermarket – Misaki’s – which is celebrating its 95th anniversary this month, and the empty lot where the controversial hotel will be built at the corner opposite the office buildings housing State agencies. Next to them is the library, closed in observance of the holiday, but its front lawn is host to a fundraising effort by local police on behalf of Special Olympics. In the carport out the back, Friends of the Library volunteers are busy sorting books and setting up for a used book sale on Saturday. The library hosts many events – author talks, music – and is another community hub. On my side of the street, the Bank of Hawaii’s bulletin board hosts the major way people and organisations get the word out in this town – fliers. The shopping area ends at the intersection known as Mile 0, and I cross the east/west highway to carry on down the road to the island’s lifeline – the wharf where the weekly barge ties up and unloads the food that’s on the supermarket shelves, and the goods and supplies sold and used by other businesses. Sometimes the weather makes the crossing from Maui too dangerous for the barge to sail – it is top-heavy with containers – as I learned one night when I went to the island’s famous Hot Bread shop and they had run out of flour, so only the first three people in line that night could be served. 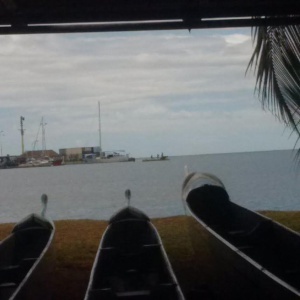 I take a rest stop at one of the outrigger canoe clubs on the edge of the harbour and watch the kids jumping off the diving platform anchored in the small area designated for swimming down near the wharf, which also hosts the fish and dive boats catering to visitors. As the organiser of the business conference held here recently pointed out, “Moloka’i does not have tourists; it has visitors.” It considers itself a home in which you are a welcome guest so long as you treat it with respect. I won’t bore you with the walk back home or the lazy afternoon I spent, but the evening had one last treat in store. Because I live so close to the community center, I can hear the bands that play at the events there, and the band at the wedding reception was exceptionally good. So good, I decide to wander down and get a closer look from the seats at the skate park next to the center. Alas, I forgot that the music has to shut down at 10 pm, so I get there just in time to watch the families whose responsibility it is to do the cleanup attack their task with gusto. Glancing up into the clear night sky, I see a shooting star.